A porch style kitchen providing access to the terrace and overlooking the courtyard garden. Light flows in thanks to the large patio doors. This effect is further enhanced by the mirror installation - behind which sliding door cabinets can be found - and the possibility to look into the bathroom via the upper windows. The combination of these glass installations adds excitement and dynamism to the kitchen and dining room. 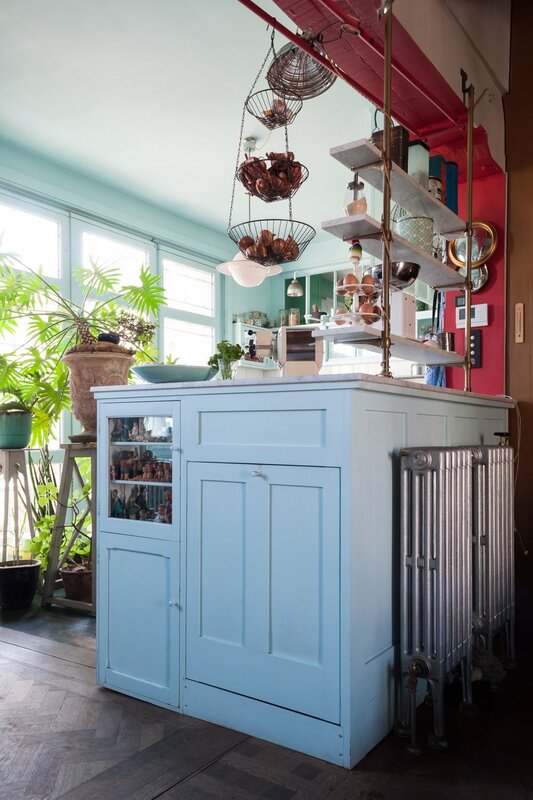 Vintage kitchen cabinets by Raymond Loewy served as a starting point for the design of the rest of the room. The cabinets have been restored and powder coated. New stainless steel worktops were custom-made to enlarge the workplace to the full width of the room. Out of the wall comes an American kitchen tap with a solid and timeless design by T&S Brass. Above the independent Lacanche stove with coup de feu plate hangs a metal cooker hood housing with cathedral glass on the ceiling. Between the dining room and kitchen you can find a combined cupboard with a built-in dishwasher. I placed it in the corner, so that it can easily be reached from the dining room. Right next to the it I placed a small display case and storage cupboard with recovered wooden doors. On top is a Carrara marble worktop. A vintage brass and marble store shelf provides extra storage space. A cupboard housing a built-in refrigerator and finished with brass fittings sits between the patio door and dining room. 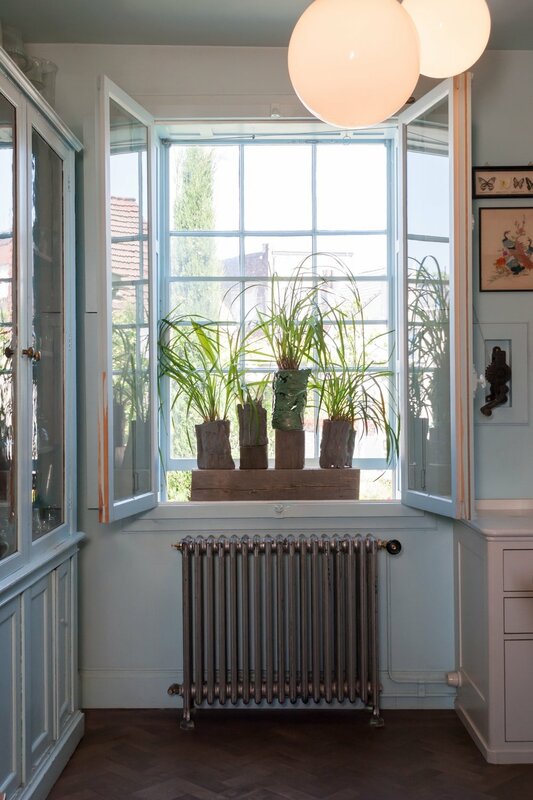 In the dining room, the window, resembling an English guillotine window, opens onto the courtyard garden. The style and design make it an active part of this interior. The outer window has an iron small wood distribution, with recovered glass inset with mastic. It can be opened by a winch, recovered from an antique roller shutter. The inner window has double glazing for extra insulation. On the inside the window is finished with wooden shutters in four parts: bottom, top, left and right. By aligning the shutters it is possible to play with the incoming light. The inner window, outer window, the shutters and all fittings are painted in the same colour as the wall to add attention to the gap and the decorative elements. Both exterior and interior windows are built upon the wall to increase the gap between them. This gap acts as a cold greenhouse with a few houseplants. The eye-catcher in the dining room is a light blue, newly composed cupboard, also called 'a marriage cupboard', as the upper and lower parts did not originally form a whole, but were later merged. You can see that the lines of the design are not attuned to one another and that other techniques have been used. In its former life, the upper cabinet probably functioned as a hat cabinet, with a display cabinet at the top and a food cabinet at the bottom. It was recovered from the Indian Caps factory in Antwerp. The cabinet has been altered with fitted shelves, behind which antique mirrors have been installed. I also installed mirrors above the cabinet. The entire wall thus comes across as one whole, consisting of both open and closed parts. In front of the closet is a long beech table. This is a replica of a market table: it can be disassembled in a leaf and two legs that fit on the springs under the leaf with an "over-shifted lock connection". The tabletop is an untreated beech leaf that has been scraped. The edge has been slightly rounded for user-friendliness.